(Nanowerk News) Professor John Boland, Director of CRANN, the Science Foundation Ireland (SFI) funded nanoscience institute at Trinity College Dublin, has today been presented with a top international award for his contributions to the field of nanoscience and nanotechnology. 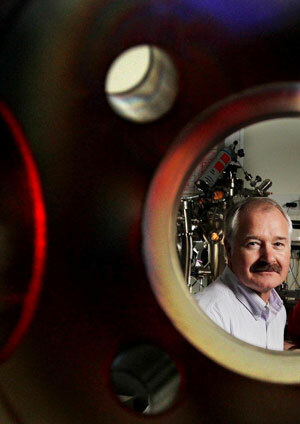 Professor Boland has been named the Laureate of the 2011 ACSIN Nanoscience Prize for his outstanding work in the development and application of scanning probe microscopy and spectroscopy and in the use of these tools to advance our understanding of chemical and physical phenomena of materials. The ACSIN Nanoscience Prize is awarded every two years and recognises superior achievements and visionary work in the field of nanoscience. It was presented to Professor Boland at the ACSIN-11 conference in St. Petersburg today. John Boland, Director of CRANN. In receiving the prestigious prize, Professor Boland joins the ranks of previous winners including eminent academics, all of whom went on to achieve even greater recognitions. Previous Laureates include Albert Fert from Université de Paris-Sud in 2005 who subsequently won the 2007 Physics Nobel Prize, Masaru Tsukada from the University of Tokyo in 2007 and Walter de Heer from the Georgia Tech in 2009. Commenting on his receipt of the prize, Professor Boland said, "I am honoured to receive the ACSIN Nanoscience Prize, to be recognised for my research and that of the numerous students and collaborators I have worked with during my career. I am especially pleased to be given an opportunity to address this audience of distinguished academics and scientists here in St. Petersburg." "I am also particularly proud to represent Ireland and to draw attention to our achievements not only in nanoscience but in all areas of science and technology. Ireland is now placed 6th internationally for nanoscience - a ranking that is due in no small part to the excellent work of my colleagues in CRANN. This world-leading research has attracted both multinationals and smaller indigenous companies to work with CRANN, and we now collaborate with more than 80 companies." "Nanoscience is now recognised internationally as the key enabling technology driving economic growth. Nanotechnology underpins many key sectors of the Irish economy – ICT, pharmaceuticals and medical devices among others, is estimated to contribute 10% of our national exports and is linked to over 120,000 jobs in Ireland. It is important therefore that conferences such as ACSIN exist, in order to highlight the importance of nanoscience and nano-enabled technologies, its everyday application and the opportunities it can create both economically and socially." John J. Boland is Professor of Chemistry, SFI-funded Principal Investigator and Director of the CRANN Nanoscience Institute, Trinity College, Dublin, Ireland. He received a PhD from Caltech, worked as a Staff Scientist at IBM Research in NY, and appointed the J.J. Hermans Chair Professor of Chemistry and Applied Sciences at the University of North Carolina at Chapel Hill. He joined the School of Chemistry at TCD in 2001 as SFI Principal Investigator. He is a Member of the Royal Irish Academy; a Fellow of Trinity College, the American Vacuum Society (AVS) and the American Association for the Advancement of Science (AAAS).